The Klarity Duo Align™ Full Body System is a lightweight and adaptable positioning solution for head, shoulder, and full body placement. Made of strong and durable carbon fiber, the Duo Align™ System is fully indexable and compatible with both U-Frame and O-Type head masks as well as pelvic masks. An Overhead Arm Positioner attachment allows for additional arm placement options, and the optional Groin Lock attachment allows for pelvic mask fixation. The baseplates can also be used with standard Silverman headrests, AccuCushions®, vacuum bags, and indexing bars. 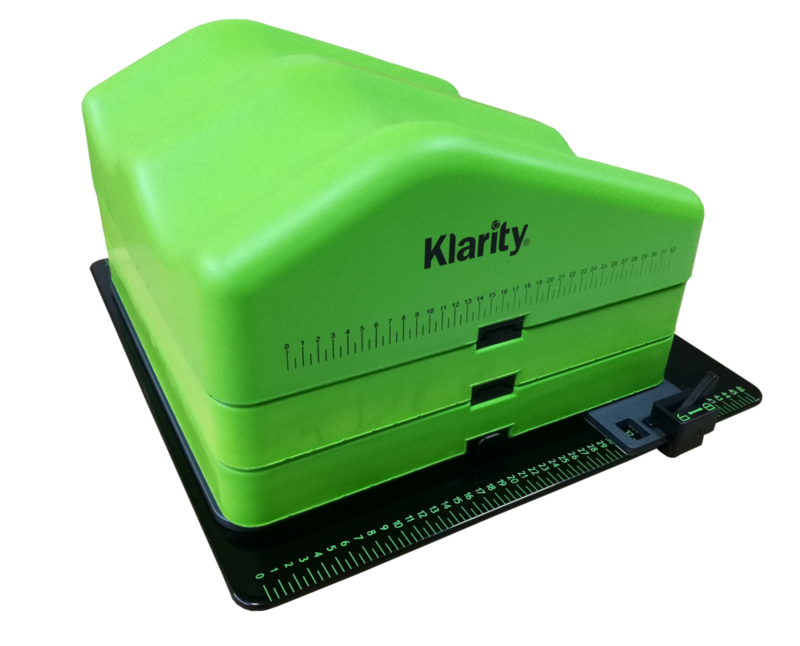 The Klarity Duo Align™ Baseplate is a lightweight and simple positioning solution for head, shoulder, and full body placement. Made of strong and durable carbon fiber, the Duo Align™ Baseplate is fully indexable, and compatible with both U-Frame and O-Type head masks. The baseplate can be used with standard Silverman headrests, and is compatible with the R605-WCF Overhead Arm Positioner and Leg Positioner cushions. It comes with an optional Groin Lock for pelvic masks. The Klarity Overhead Arm Support easily and securely connects to the Duo Align™ Baseplate. It allows for comfortable arm support to improve positioning accuracy and reproducibility. The height of the arm supports is adjustable in six angles between 20-46˚ and they have a rotating arc of 0-170˚. The height of the Wrist Cups is adjustable between 18.5-25.4cm. The Klarity Leg Positioner Cushions are comfortable foam cushions for ergonomic and adjustable knee and leg support. The cushions have a movable range of 0-46cm and can easily be locked or unlocked to the Duo Align™ Baseplate. It comes with an acrylic baseplate, a KneeFix Cushion, and two Elevation cushions. The R550-L is a long, versatile AccuCushion® that offers multiple types of custom support. 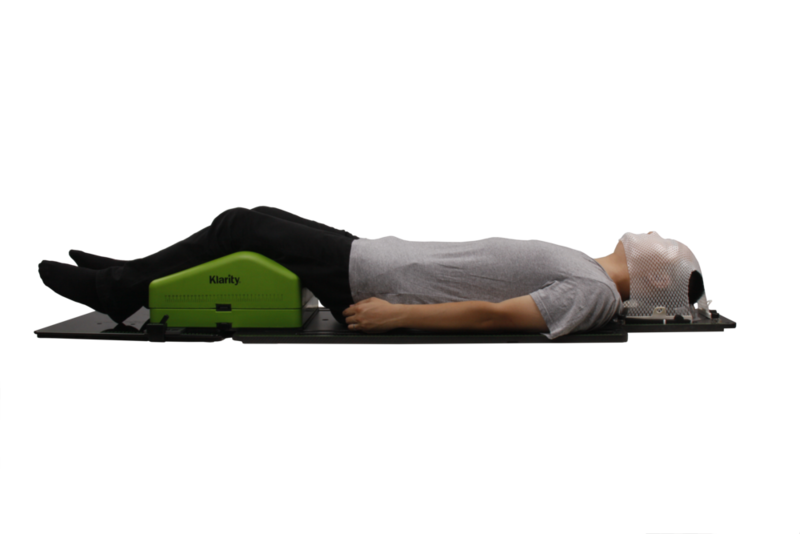 It can be used under the head and neck with a standard Silverman headrest, providing a long line of support that extends from the C-spine to the crown of the head. It can also be used to mold around the arm and wrist as well as other extremities that require customized positioning. Klarity Head & Shoulder AccuCushions® provide additional customized support and immobilization around the neck, shoulder, and scapula. They can be molded by hand, or with the optional strap set and Shell System (for HS2L and H1 AccuCushions®). With extra fill in the neck area, the R550-T2 is ideal for situations requiring customized tilt and pitch of the head and neck, or when a large amount of build-up is needed under the C-spine. The T2 is designed for use without a Silverman headrest and indexes directly to the overlay or baseplate. The cushion sits under the scapula and wraps up over the shoulders to create more fully encompassing support around the neck and shoulders. The R550-T2L offers even more customized support. The T2L is 5 cm longer than other head and shoulder cushions, which means that it extends further down the back to provide additional scapular support. The HS2L is our most comprehensive AccuCushion®. Designed for use without a Silverman headrest, this cushion indexes directly to the baseplate or overlay. The extra fill in the neck allows for custom positioning for precise tilt and pitch. The sides of the HS2L wrap up and around the sides and crown of the head, creating a 360-degree shell around the patient. For optimal reproducibility, it should be used with a Head & Shoulder Mask. Carbon Fiber Head Supports fit a variety of tabletop and couch types. They can be ordered individually, or as a set of six for all different heights. Carbon Fiber Head Supports index to standard silverman pins, and can be used with any baseplate that uses standard silvermans. The carbon fiber material is extra durable and lightweight. Clear Silverman Head Supports fit a variety of tabletop and couch types. Silverman head supports are sold individually, or as a set of six, with six different heights for customization.